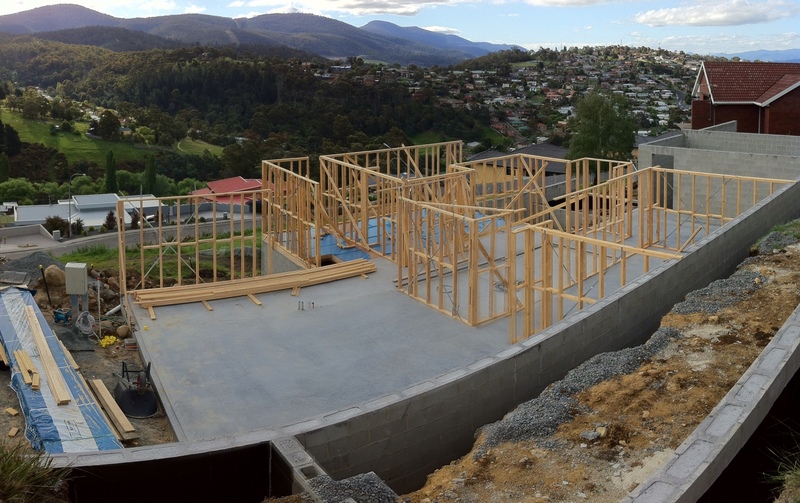 The first floor framing started just before Christmas! ... and as before, it went up rather quickly.. 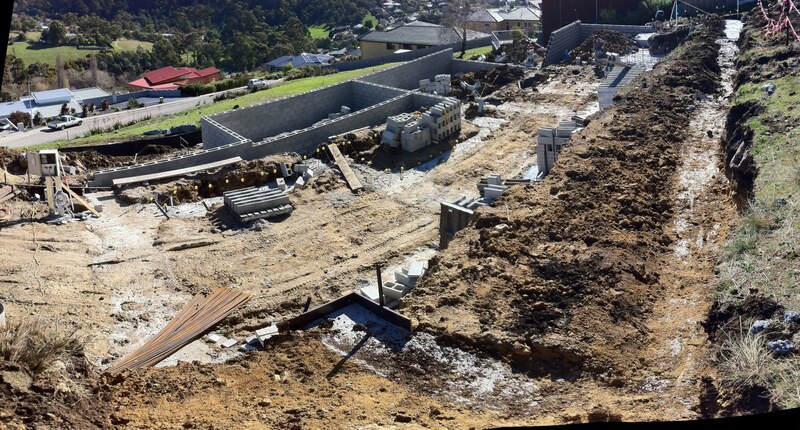 The relatively steep slope means that we can get a view of the roof by just walking up to the next block! 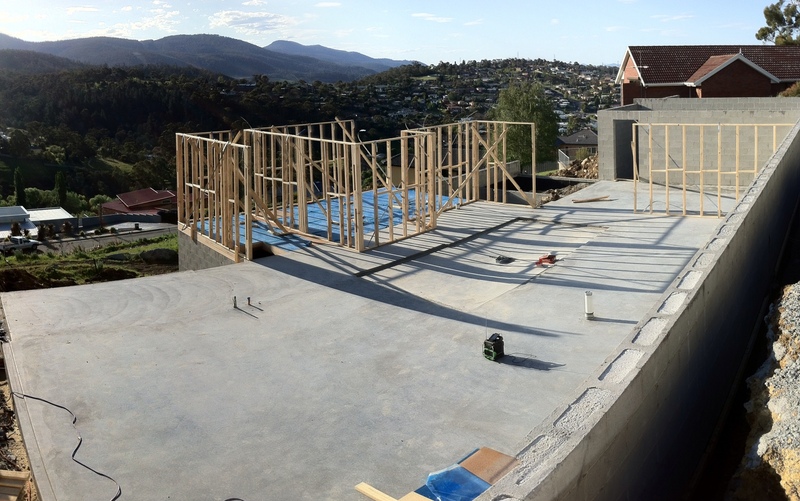 Here is the framing completed, ready for the roof to go on. 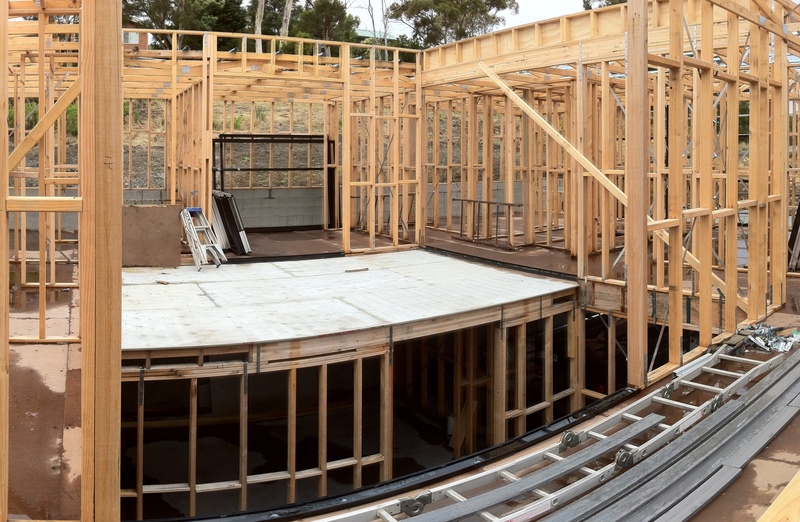 Keen eyes may see some of the decks are in... the internal deck has been covered with cement sheeting (waterproofed - since it is above the home theatre room it is fairly important!) We will have another finish on top of this, details to be confirmed later. 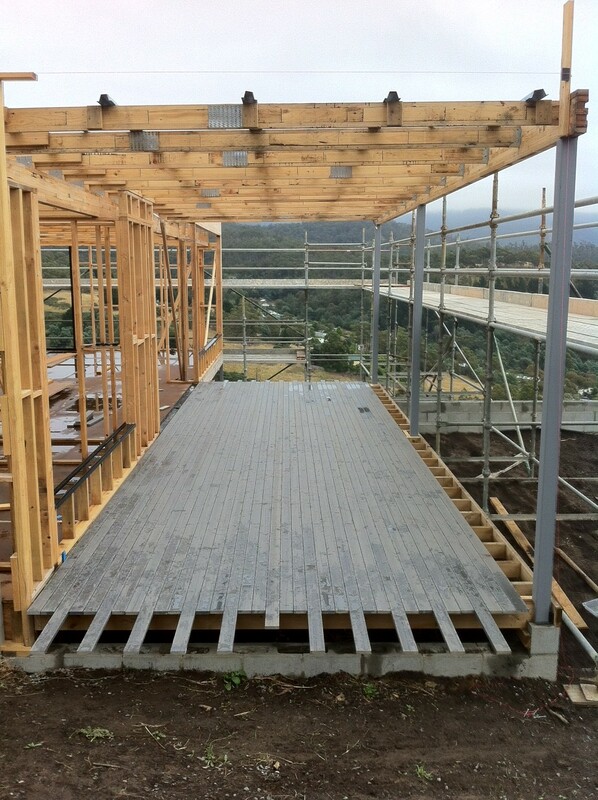 .. and the room under the rear deck - which will contain the water tank, hot water cylinder, and so on - has had a treated pine deck - nothing fancy. In the picture below it had been raining which makes it look all shiny! 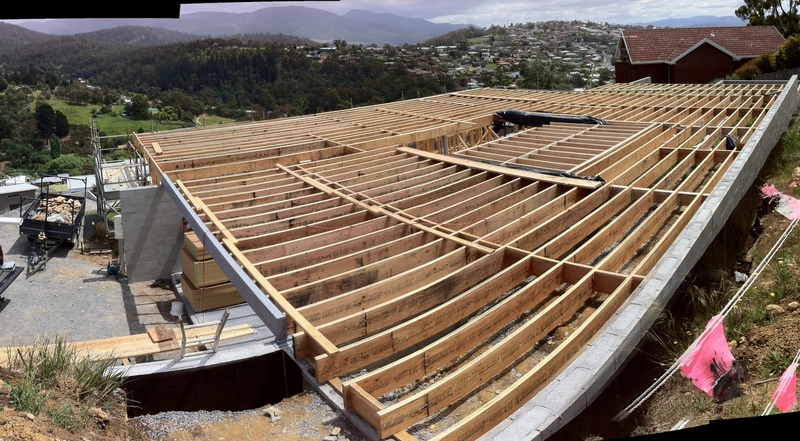 Both the rear deck and the lower (drying) deck have been done in Modwood - a product made of recycled plastic and sawdust! 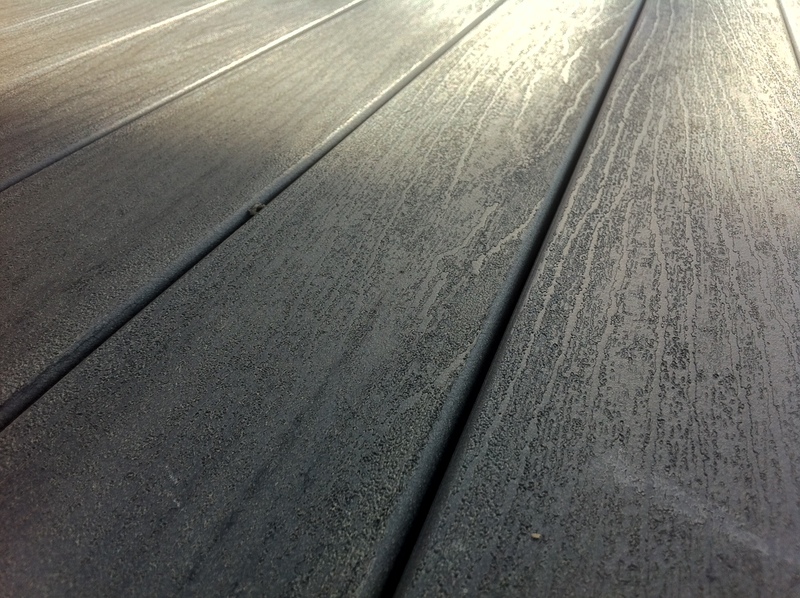 It doesn't require lots of maintenance like a timber deck, is environmentally friendly and looks great! 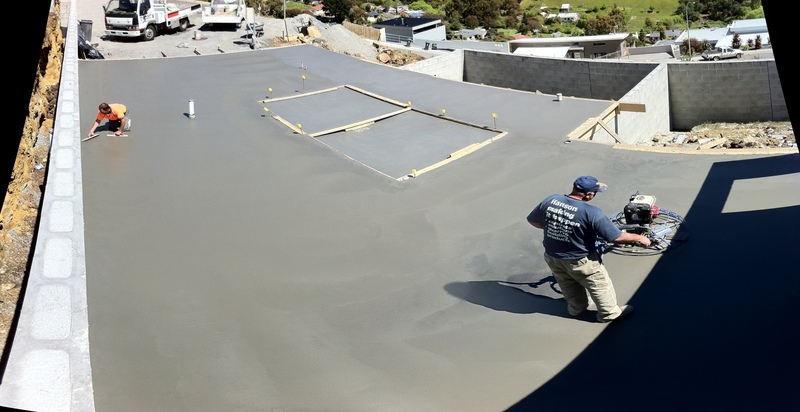 The finish we have used is 'Silver Gum'. Plenty of updates in the next couple of weeks, roof and cladding of course, but also bathrooms, kitchens, electrical, and more! The first three months - digging! I just realised my last update ended with the words "hopefully future updates will be more often than every three weeks" - how embarrassing! A picture tells a thousand words ... these photos show the progress until the end of September. 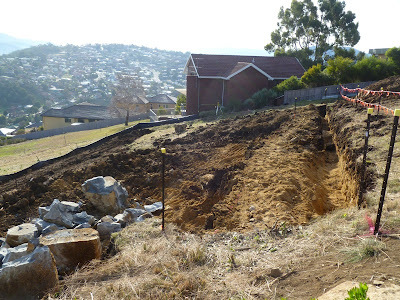 The most disastrous thing was being delayed an extra week due to some of the dirt wall collapsing. Also here is a close-up of the rear of the house - this has confused a few people! 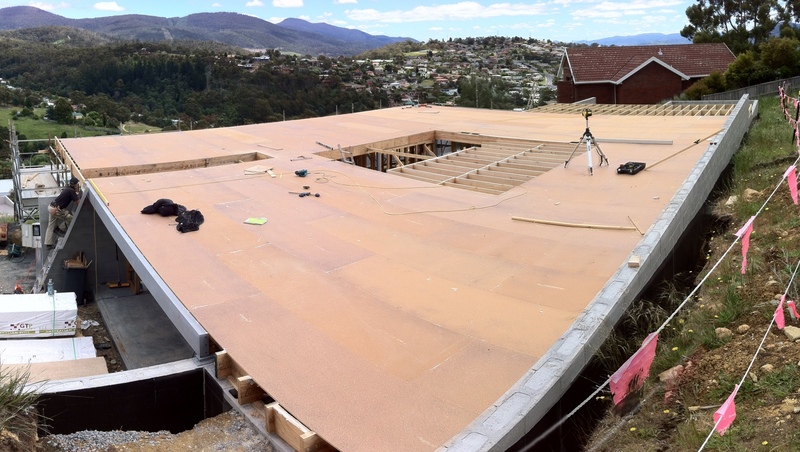 - The middle of the picture shows where the back deck will be - it will cover the two enclosed areas below. 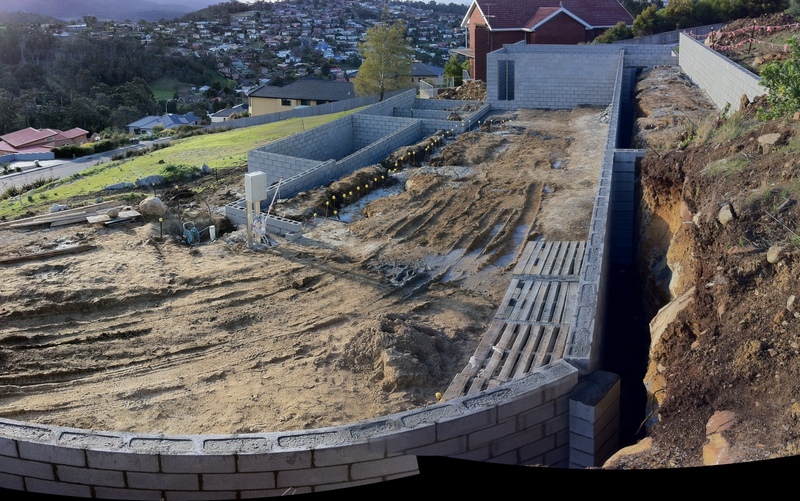 Of these areas, the back section houses the water tank (and will also house the hot water cylinder and the external part of the heat pump) and is accessible from the rumpus/storage room on the ground floor as seen in the previous pics. The section nearest the camera iis void/inaccessible. 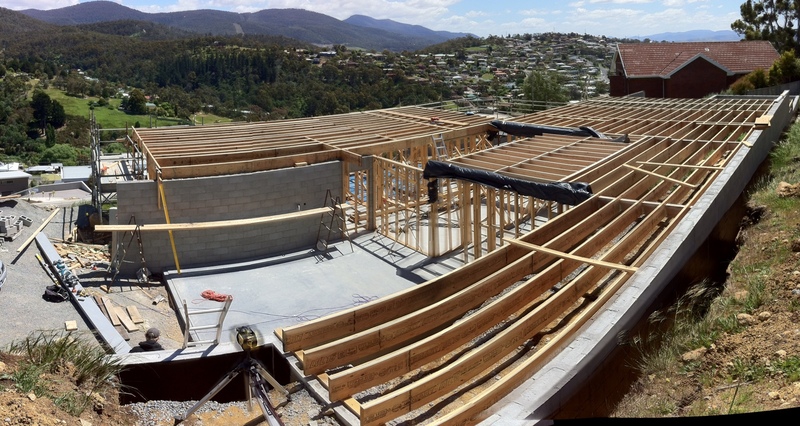 The roofline of the house will cover the deck. 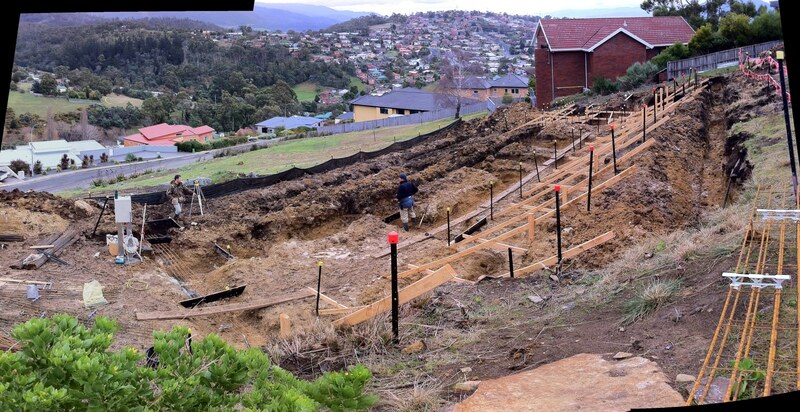 - The right of the picture shows the two terraced grass play areas which will be accessible from the deck via a couple of steps. No, these aren't rooms - just big concrete boxes full of dirt! The Examiner - "Launceston may host Harry Kewell". The Mercury - "FFT investigates brawl". Just another example of how biased The Mercury is. Of the thirteen top stories in the Mercury soccer section, six are about the "racial abuse" issue (the rest are local club news and match results). However, in that time period (19 June - 8 July), The Mercury has also published articles about soccer workshops during World Refugee Day ("Kicking off a new life", 26 June) and an update on the Tassie A-League bid ("Tassie A-team in the pipeline", 30 June). Why aren't these articles included? Too positive? Don't they suit The Mercury's point of view? This isn't unique to the Tasmanian media - it happens all across the country, sometimes it is subtle, often it is patently obvious. In any case, nothing is going to change if we stay silent!